MANOR LANCASTER ESTATE Cavite. Ready for occupancy townhouses near Airport. Save your rent and fare. Manor townhouses is near St. Edward Integrated School, a La Salle supervised primary and secondary school. This place is near to everything, mall, commercial area, hospital, church and amenties. Your children will love it here.Prepare to be surprised, you won't find a more complete finish townhouse in this price and location. View today. And compare the difference in location, size, price and payment scheme. Don’t let this opportunity pass by. Size - Lot area: 40 sqm. House Area: 40 sqm. 2 storey townhouse. Location - Only 18 km. or 25 mins. from Airport, Mall of Asia, Baclaran, Pasay & Makati thru Cavitex Highway. Space - 3 bedroom w/partition, 1 toilet w/tiles, 1 garage. Painted finish inside & out. W/electrical outlet & socket. Price - Only Php 870,000.00 selling price excluding misc or processing fees. Low Downpayment & Charges - As low as Php 21,615.00 per month. No bank charges. No move-in fees. Flexibility of Payment - 10% down payable in 4 mos. No interest. Developer will process your bank loan. Simple Bank Requirements - No minimum salary bracket. No Payslips, Certificate of Employment. No Co-Maker. Access in Transportation - 24 hours bus & jeepney are available. Just one bus ride to Baclaran, Pasay, Makati & Lawton Manila. Inhouse Marketing - Profriends, Inc. Lot Area: 40 sqm. / Floor Area: 40 sqm. Don't be a victim of scams. Have peace of mind. Be safe. Protect your investment. 1. Downpayment and amortization will not be paid at the same time. 2. Downpayment will be paid first in 4 monthly installment. 3 The Amortization will only start after 4 months. After the downpayment term. Limited availability. Only few units available with this price. Always ask if available. Corner and end lots have bigger areas, so price is higher by 10% or more. Every block has different prices. Price is higher for lots facing east, main road and near entrance. Ready for Occupancy houses are in this payment scheme. Reservation fee, downpayments and amortizations are NOT refundable. But it is transferable to another unit provided under same agent and developer. Transfer Fee: Php 3,000.00. Other terms and conditions apply. Please read our Frequently Asked Questions. Amount needed to open: Php5,000.00 + Php375.00 for check booklet. If Buyer is a Filipino Immigrant, must have a Dual Citizenship. Must be 18 yrs. - 50 yrs. Must not be more than 50 yrs. old. No problem with marital status. No separated with wife or husband. No cancelled credit cards. No credit card on amnesty. No unpaid loan account. Must be 18 yrs. - 50 yrs. 1. Tripping Schedule. Email, call, text or chat us for your viewing schedule if you want to visit and view the actual turn-over model unit and actual location. Any representative is allowed if you are not available. 2. Price, Terms and Payment. After viewing the actual site and model unit, have a sit down discussion on price, terms and payment with our Sales Consultant. Ask for a sample computation and request for an explanation about the terms and process of payment. 3. Buying Decision. Choose the best location of block and lot no. from available unit base on our Sales Map. 4. Reservation Payment. Pay the corresponding reservation fee. Reservation payment will finalize the buying process and ensure the chosen unit will be reserved in your name until the first downpayment is due. 5. Submission of Required Documents. There are list of documents that Developer will require from home buyers. This will be given during reservation and must be submitted within 60 days from reservation date. Delay in submission may cause delay in house construction and bank loan evaluation. 6. Monthly Downpayment. This will start within 30-45 days from reservation date. Payment will be on monthly basis and will last until end of DP term. 7. Monthly Amortization. This will start after the downpayment term is paid. 8. Follow-ups and Updates. For Profriends housing projects, they have Customer Service where home buyers can email or call. Verify Payments. Request for a Payment Ledger. Buyers may submit by scan email ID, cedula & passport. Unit ID - Always indicate your Unit ID (Block & Lot of your house) in all emails sent to Profriends. Request Approval - Request approval may take 2-4 weeks. Send Us Copy - Please don't forget to CC or send us copy of your email for future references. 9. House Inspection & Move-in. You will notified thru letter/mail once your house is ready for inspection. Buyer will get this Certificate of Inspection (CFI) at the main office. During inspection, you will list down all parts of the house you think needs retouch, repair or clearing. You will be asked to come back after few weeks for the second inspection. Once you see the unit is okey and acceptable, you may sign the acceptance certificate. Bring this certificate to the main office and go back to Engineering Office at site to get the key. No Certificate of Inspectin (CFI) is allowed. Incomplete submission of documents, No Move-in is allowed. The Homeowners Association Fee will start once you receive the Inspection Certificate regardless if you have not move-in or live yet in your unit. Light and Water will be personally applied by the Home Buyer after he accepted the house and received the key. There is a Construction Bond if Buyer decides to improve, construct, fence the unit. Amount vary depending on the project which range from Php6,000 - Php12,000.00. This is refundable after no damaged is done during construction period. 10. Congratulations! On your new home. Construction Status: Ongoing. There are ready for occupancy Manor units. Now called a township, Lancaster Estates is a 1,000 hectare masterplanned community concept launched in March 2007. The biggest housing project in Cavite that starts in Kawit, then Imus and end up in General Trias, Cavite passing through Daang Hari Extension. The development is well-crafted with a comprehensive planning system that includes a variety of housing types with each individual entrance gate in every villages, fully secured, controlled & guarded 24/7. All villages are linked together by tree-lines streets and boulevard, network of paths & lush landscape, Lancaster Estates has attracted more than 4,000 residents. 1. Lancaster Residences. Location: Imus. 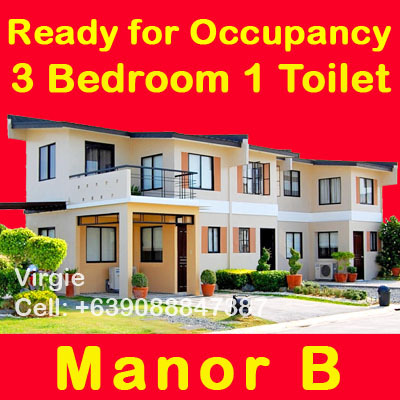 Offers Manor Townhouses with 3 bedroom (BR) 1 toilet (T&B). Price: Php 939,600.00 - up. DP: Php 21,615/mo. 2. Lancaster Villages Phase 1 & 2. Location: Kawit. Offers Single Attached houses with free linear park like Colleen House with 3BR / 2T&B. Price: Php 1,836,000.00 - up. DP: Php 13,966.67/mo. While Haven House has 4BR / 2T&B. Price: Php 2,232,360.00 - up. DP: 17,269.67/mo. 3. Kengsington Place Phase 1-10. Location: Gen. Trias. Offers Alice Townhouses with 3BR / 1T&B. Price: Php 918,000.00 - up. DP: Php 7,150.00 While Diana Townhouses has 3BR / 2T&B. Price: Php 1,296,000.00 - up. DP: Php 10,133/mo. 4. Sommerset Village Phase 1-10. Location: Gen. Trias. Offers 2 single houses with free linear park & fence at the back like Margaret House with 3BR / 2T&B. Price: Php 2,106.000.00 - up. DP: Php 16,216.67/mo. While Sophie House has 3BR / 2T&B in 80 sqm. lot area. Price: Php 1,745,000.00 - up. DP: Php 13,210/mo. 5. Manchester Village Phase 1-10. Location: Gen. Trias. Offers 2 single house models with free linear park and fence at the back like Gabrielle with 3BR / 2T&B. Price: Php 2,563,920.00 - up. DP: Php 20,032.67/mo. While Alexandra House has 4BR / 3T&B. Price: Php 2,970,000.00 DP: Php 23,416.67/mo. Cavite has approved Development Plan. Cavite is Flood-Free because there is no dam near Lancaster Estates. Major Infrastructure Projects - are being pushed for implementation and completion to complement rapid urbanization. LRT Line 1 by approximately 11.7 km. from Baclaran to Bacoor. Hospitals Nearby: Kawit Kalayaan Hospital - 1.3 km. Take a bus to BACLARAN. From BACLARAN, ride on a bus to LANCASTER ESTATES taking the CAVITEX (Cavite Expressway). Get off at LANCASTER ESTATES transport terminal. Take a bus with LANCASTER ESTATES signboard via CAVITEX route. Get off at LANCASTER ESTATES transport terminal. From Alabang- Zapote Road junction, board a mini bus or jeepney going to LANCASTER ESTATES taking the Tirona Highway route. Get off at LANCASTER ESTATES. To keep price low, delivered unit has only plain cement flooring. But interior and exterior walls are all painted white, all bedrooms has partition, ceiling and ready electrical outlets, long span roofing, tiled toilet & bath with lavatory and bowl, tiled kitchen counter top. Furnitures, tables, beds, chairs, chandelliers, appliances, all improvements are not included in the price of the house. What we see in the actual turn-over is what we get. Below: The actual constructed townhouses come in cluster with 11 units. There is no balcony when unit is delivered. All improvement and furnishings of dressed-up models are for presentation purposes only. To give ideas on how to improve and furnish their unit. All expenses for the improvement shall be shouldered by the Buyer. Make Your Reservation Now! Don't delay! Branch Manager: Property Company of Friends, Inc. - Profriends, Inc. Warning: Don't be a victim of scams. Be safe. Protect your investment and have peace of mind. Always deal with a license real estate broker.